Hey guys, happy Tuesday! If you're in LA right now, you know it is HOT AF. Not that I'm complaining, I love a good summer heat. And I've also complained so much about Canadian winters that I feel like I'm not allowed to complain this time around, if that makes sense? Still, it would be nice to have AC, but we don't. I feel like we might be the only crazies living in LA without AC. So last weekend, I told Sasha we were going grocery shopping, and ONLY buying things that we could eat cold. My plan was to not use the oven at all this week, because, well, our place already feels like one! Needless to say, that fantasy was short lived. Because yesterday, I made 3 kinds of pizza, cinnamon bread and a pavlova cake. Which means the oven was pretty much on from 1pm to 7pm. To say it was toasty would be an understatement! But it was TOTALLY worth it because it allowed me to come up with my new summer favourite: This fresh summer pizza! I call it fresh and summery because only the crust is baked. All the other toppings are just layered on top of the crust. 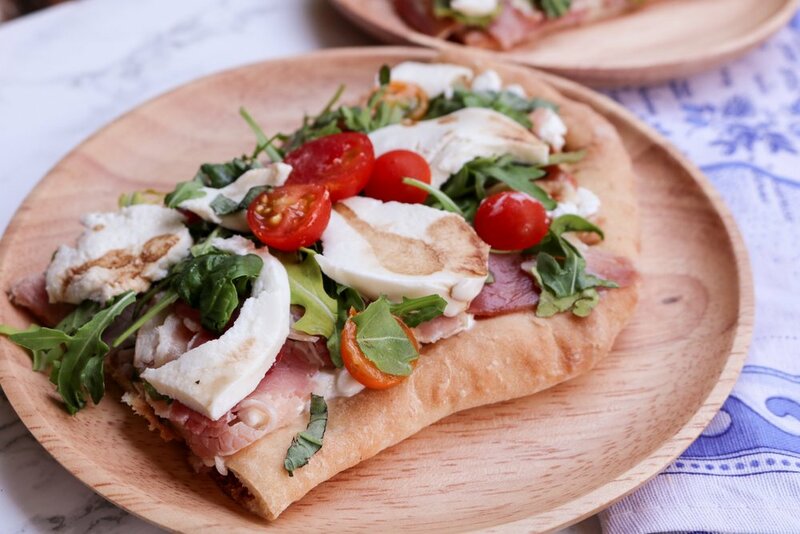 And I feel like that allows all the ingredients to really shine and retain their full flavour, instead of being baked into one big mush... Don't get me wrong, I do love traditional pizza, I just feel like this is the perfect variation for summer! This is my go-to pizza dough recipe, because the ingredients are simple, and the taste is really versatile. Since I like using the leftover dough to make some kind of bread, I love that this dough tastes just as delicious with savoury or sweet flavours. It's also the EASIEST thing ever. Just dump all the dry ingredients in the biggest bowl you have (it'll rise a lot), mix them all together, add water and knead until the dough is uniform and not too sticky. You can add more flour, 1 spoon at a time, if it's too sticky. Then, line your bowl with oil, put the dough back in and let it rest for 2-3 hours. I like to cover the bowl with a humid kitchen rag and let it rest in a warm place, to make sure it rises well. Once the dough is ready, I shape it to make pizza crusts, and I like these ones to be thin. I roll them down to maybe 1/4" and poke them with a fork. Then, I pop them in the oven at 400ºF until they're golden brown, about 15 minutes. If all of this doesn't sound like heaven to you, you're WEIRD. Seriously though, it was the best pizza I ever had, and I f*cking made the damn thing!! The combination of cottage cheese and fresh mozzarella gave it the perfect creamy, cheesy taste. The bacon and prosciutto were just amazing, with the fresh basil and arugula... And the sauce! I just drizzled it on top and it made a huge difference! That sauce is just a wonderful addition to pizzas, salad, anything you can eat, basically. I also have to add, unless you're counting your carbs, this summer pizza is also quite healthy. it definitely felt fresh after a long day around the oven, ha! If you're planning on making this summer pizza for a few friends, also look up my amazing guacamole recipe, because it is a crowd-pleaser! And if you DO make it, definitely post it on Instagram, tag me @thehungarianbrunette and use the hashtag #thbrecreated so I can see your work and share it! I'm also curious to know what your favourite pizza toppings combination is! You can let me know in the comments below, or come chat on Instagram! !